Went to his new home on Monday 27th May 2013. 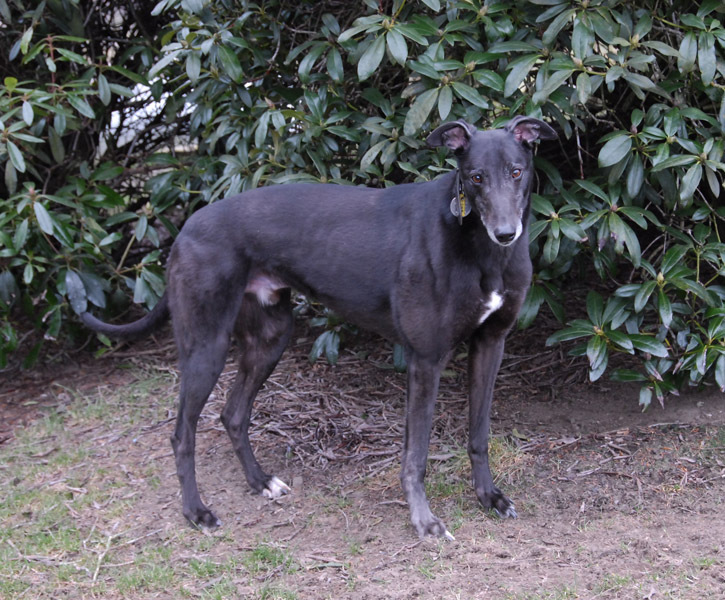 Darcy is a handsome black ex-racing Greyhound who was born on the 1st May 2008. Having lived in a home for about a month before coming here we find he is house trained. He will be neutered while he is with us and his inocuations brought up to date because he came with no paperwork. 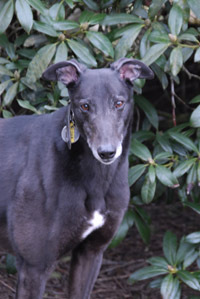 He has a lovely gentle nature, is fine with children and has settled in with us and our greyhounds very quickly. Darcy is now neutered, inoculated, microchipped and fully house trained. 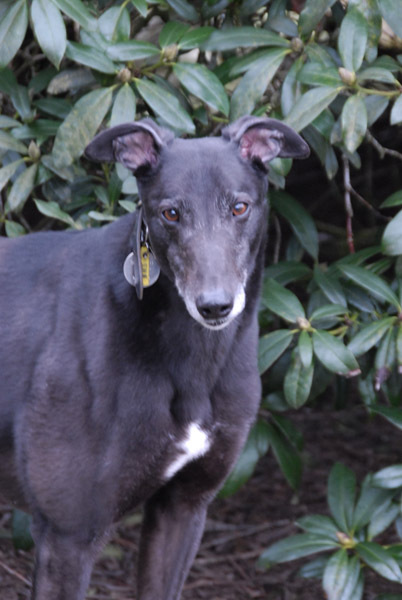 He adores cuddles, walks nicely on the lead and travels well in the car..
* The branch kennel at the bottom of our garden is where Darcy and the other resident(s) will be for the first day or so until he gets to know the other greyhounds. 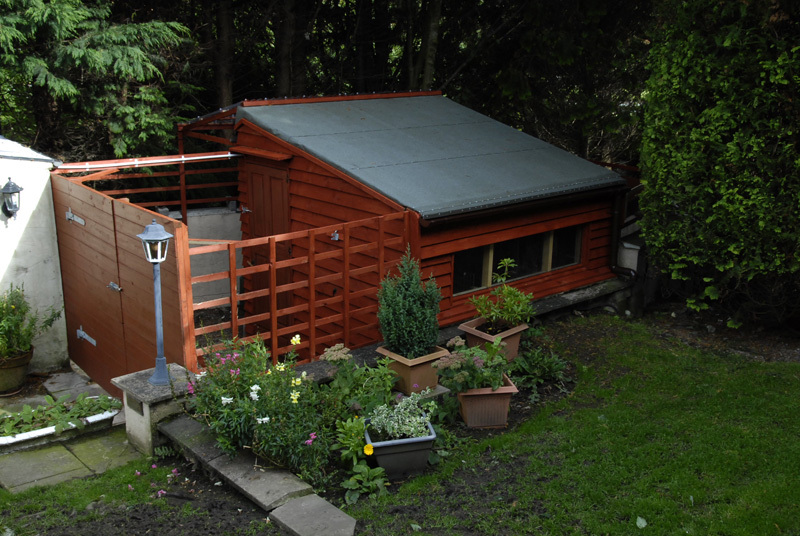 He has use of our garden and paddock, and once he gets to know the other dogs he will be allowed in the house during the day and all the dogs will then take it in turn to sleep in the house at night, so they become use to sleeping in both the kennel and the house. 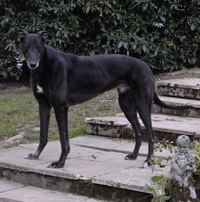 Darcy went to the vets this morning where he weighed in at 37.6k. He was examined, given his first inoculation because he came with no paperwork and was neutered. Everything went well, but he was a little quiet and subdued when we got him home. Don't think he was too pleased! In the evening after a meal and his last toilet off he went to the kennel where he cuddled into his bed for the night, and although the camera and sound was on in the kennel he never made a sound and hardly moved all night. This morning when I opened the kennel to let Darcy out he gave me a lovely welcome, thoroughly enjoyed his breakfast then went in the garden to do his toilet before coming in the house and settling on one of the dogs beds for a sleep and a rest. Later in the day we caught him licking his stitches, but with a firm 'leave' he soon got the message and left them alone. Darcy is a lovely dog and enjoyed all the fuss and cuddles one gets that has been in the vets. He just loves standing by our side asking for his head, neck and shoulders to be stroked. This afternoon Treacle and Darcy were adopted, all the paperwork complete and off they both went to their new home where we hope they will have a long and happy life together. We heard today that so far - Treacle and Darcy have been brilliant. They had a super night. Their new owners put them in their beds in the hall and after they had explored upstairs and were settled down again they never heard a peep all night. Their new owners had a lovely welcome when they came downstairs this morning. They have both finished all their meals in short order as well so they say they must be doing something right! 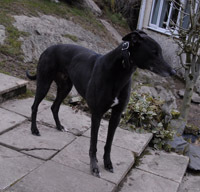 We received an email this evening letting us know that Darcy's new owner took took him to the Vet this evening. He drained the fluid off his swelling (mainly watery blood) and pronounced that he thought it was an abcess. Darcy has been given antibiotics to take as well as anti-inflammatory tablets and they have to take him back on Saturday. If the swelling has gone down all is okay. If not, it will require further investigation. The vet said it could be a tumour but he thought it highly unlikely. They will keep me posted. Needless to say, Darcy was a star throughout the whole procedure and only yelped once when the vet got a little rough with the needle. We heard today that in himself Darcy is fine. The lump is still there but smaller. It is not giving him any problems and does not appear sore at all. There is no skin abrasion or discolouration (he was shaved before the vet aspirated it). They really do hope it is nothing serious. He is eating well including his antibiotics and enjoys his walks. On that subject they have been letting Treacle off the lead and his behaviour has been exemplary. We tried with Darcey which went well at first with him running with Treacle. However, when Treacle turned to come back Darcey carried on and they finally found him in the next field talking to some fishermen with no interest in coming back. 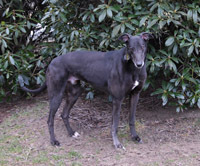 They have also found he has not yet learnt to distinguish between small dogs and rabbits although they have been working at socialising him with other dogs. They obviously have more work to do there. He sees himself as dominant dog and whereas Treacle was quite nervous at first (rapidly changing as he gets used to his new environment) they have yet to find anything to faze Darcey. They will let me know what the vet says after their visit on Saturday. We heard today that Darcy's owner took him back to the vet today. Saw the senior partner this time. Darcy's lump was about the same size as after it had been drained on Monday. The vet examined it, drained the rest of the fluid off and pronounced that in his opinion it was a cyst, not an abcess, and that he may be a dog that is prone to them. Could not give a reason for it appearing and he has to be kept on antibiotics for the next 10 days. He sees no need for any further appointments unless something develops that they are unhappy about. Darcy as usual took the needle in his stride and made no fuss at all. A great weight off their minds. Treacle continues to be fine and although he makes no move to play with Darcy he does not like to be far away from him. When they are on a walk the one walking Treacle can't choose to go a different way to the one with Darcy because Treacle just plants his feet in the ground and refuses to move! Both dogs have settled in really happily. 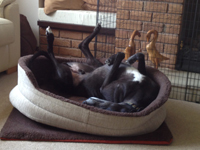 Lots of fun and tail wagging, eating well and enjoying their walks. No destruction or problems in the house. They have quickly learnt their new routines and happily conform. Their new owners love them to bits and they are being spoilt rotten in the nicest possible way! After initially using Darcy to boost Treacle's confidence, Treacle has now become the dominant dog, and Darcy seems to accept this. However, there have been and still are some hurdles to overcome. Darcy is hopeless off the lead! 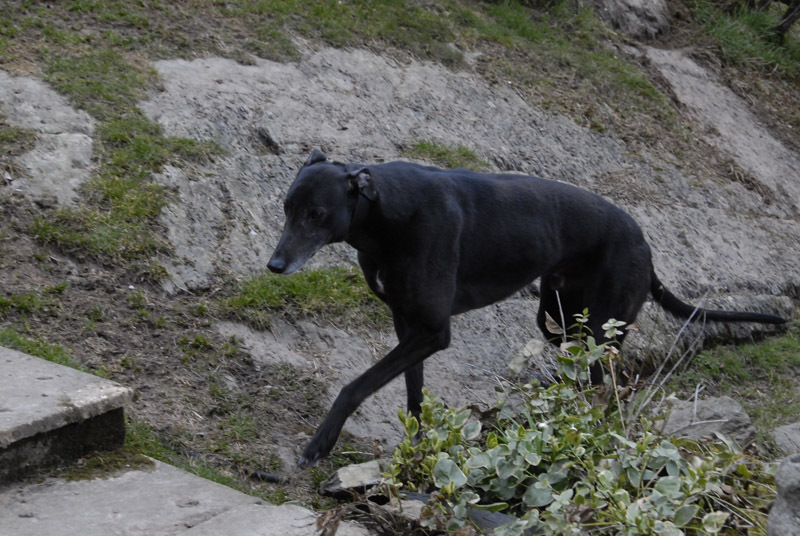 Despite being very obedient to recall at other times (and being rewarded well) he just took off and never looked back when they tried letting him off the lead. 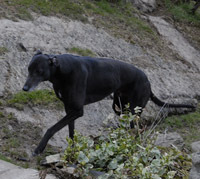 They shall give it another try in due course, but meanwhile he is happy enough on the lead. He has also proved unreliable with the grandchildren. After initially being very fussy and happy with them, he quite quickly became snappy and intolerant during their first visit - and was even more so the second time he met them. They believe he is scared, because his behaviour is possibley from some bad experiences while with the family, who had a number of very young children who wouldn't leave him alone before he arrived at the South Lakes Branch. For the time being he is kept muzzled and the boys are kept away from him, and he is given lots of praise and encouragement whilst he remains in the room with them. This weekend there was some improvement in his behaviour and they are hopeful he will become more relaxed in their company. The cyst has now completely disappeared. 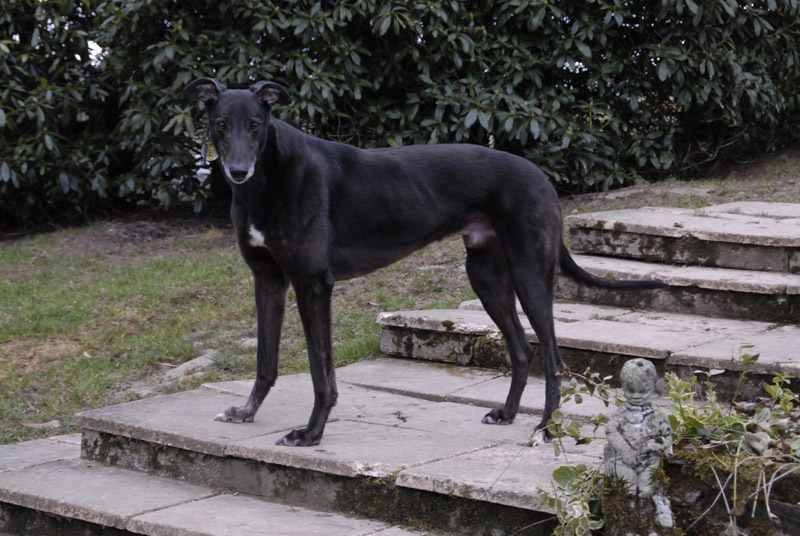 His new owners say they can say unreservedly it's lovely to have greyhounds back in the house again.